Cuba's leading pianist, Robert Fonseca, is coming to the UK with a band made up of Cuban and West African musicians during March and April to promote his new album "YO". Roberto Fonseca is one of the most charismatic Cuban musicians of his generation. The Buena Vista Social Club prodigy and Havana Cultura star has grabbed Cuban music by the horns and drawn it, hot, stylish and sultry, into the 21st century, and his live shows have been captivating audiences worldwide for more than a decade. His new album, "YO", is out this Spring and is his most daring one to date. Fonseca explores new sounds and dimensions blending traditional acoustic instruments with elements of electronica and pays homage to Cuba's African roots whilst striking forwards with red-hot grooves, electronic beats and sensuous lyricism that effortlessly updates Cuba's musical lineage. Fonseca hits the road as the album is about to be released with a seven-date UK tour starting on Friday, 23 March. The tour line-up features Fonseca on piano and keyboards, Baba Sissoko on African percussion, Joel Hierrezuelo on Cuban percussion, Ramsés Rodríguez on drums, Yandy Martínez on bass, Jorge Chicoy on guitar, Javier Zalba on sax, flute and clarinet and Sekou Kouyate on kora. 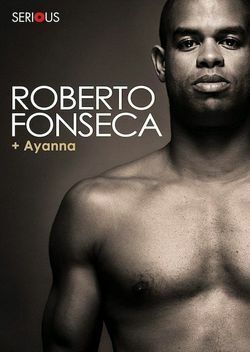 This group is the sound of things to come in Afro-Cuban music, and with Roberto Fonseca at the helm, it is sure to be one of the live shows to catch in 2012. Support is from Ayana - the first non-American to win the legendary Amateur Night Live at the Harlem Apollo, whose beguiling vocals skip and swing over intimate, honey-sweet cello. Her music was recently celebrated in an evening devoted to her work at the Kings Place Festival in London. Last year she was commissioned to write a new piece for the Bath Festival, following residencies at Wigmore Hall and Aldeburgh. She’s just finished a UK tour with Natty and recording in New York with Kronos Quartet, which neatly captures her full range.